Fantastic. It’s St. Andrew’s day and I have a nice large whisky tumbler in my hand. In front of me, my completed novel! Yep, after 30 days, and a very patient and understanding wife I have managed to unload my novel, with a grand total of 55,720 words, written from scratch entirely in the month of November. 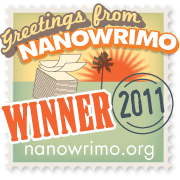 I’ve just uploaded the text with about 90 minutes to spare for verification and now have my winner’s badge. 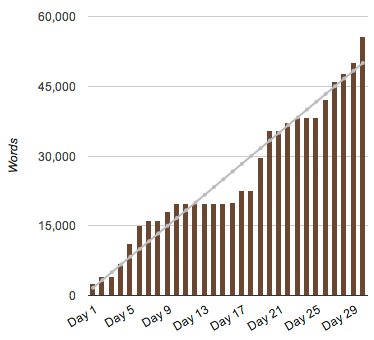 As you can see from my word-count stats below I had to push hard for a couple of weekends to make up for days lost doing other things or just getting blocked. That was fun, I ran a little dry for a week or two but managed to pick myself up again. It has a beginning, middle and an end but will most certainly benefit from at least one read through to straighten the plot out. I’ll leave that for the new year. Anyway, I must admit to being rather pleased with myself. My mistake – it’s now 1,175 miles to empty tank! What can you build with your 62 pieces of Lego?